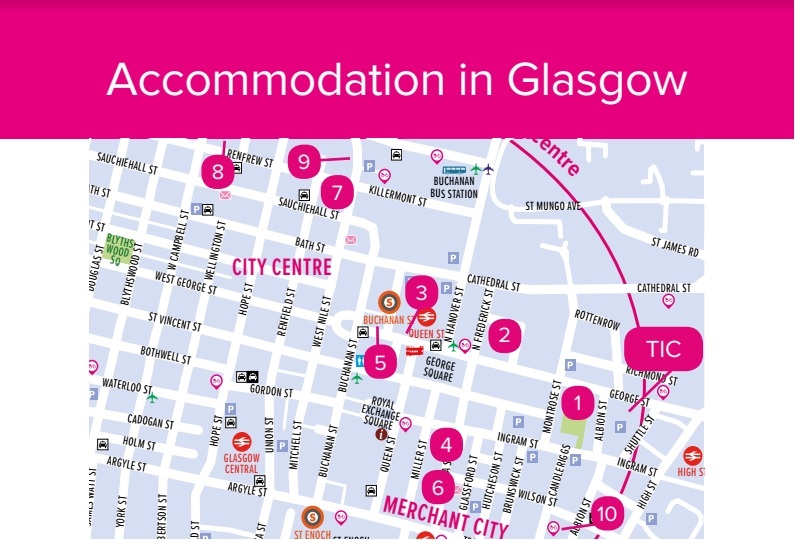 Whether your style is a luxury hotel retreat, a vibrant hostel, homely B&B or a comfortable city center apartment, you can be assured of a warm Glaswegian welcome. For information on accessible accommodation visit the online guide at Disabled Go. Currently 28 daily services to London. (PIK) is 32 miles (51km) South West of the city. It's a main base for Ryanair and serves European destinations. Prestwick has its own train station. There are 3 trains per hour on weekdays and the journey to Glasgow Central Station takes around 50 minutes. (EDI) is 39 miles (63km) from Glasgow and serves most major international airlines. You can get to Glasgow from the airport by either bus, train or taxi. Scottish Citylink provides direct bus services from Edinburgh Airport to Glasgow's Buchanan Bus Station every 30 minutes. Alternatively you can catch a bus or taxi to Edinburgh Haymarket and then catch a train to Glasgow Queen Street Station. Lothian Buses provides public transportation to Edinburgh Airport with the Airlink100 express bus from Edinburgh city centre as well as local bus services. Glasgow Queen Street Station provides the main rail link between Glasgow and Edinburgh, with 8 direct services per hour on weekdays. Glasgow's timezone is Greenwich Mean Time (GMT) or one hour ahead of GMT, known as British Summer Time (BST), during the summer months. Spring (March – May) in Glasgow enjoys mild temperatures with the city’s parks and gardens filled with spring flowers. The summer months (June to September) can vary between mild and warm and sunny, with the advantage of up to 16 hours of daylight for visitors throughout the summer. Winters are colder, with a January average of 4.0°C (39°F) and occasional snow. Smoking is banned in all public places including all enclosed or partly enclosed public areas. To drive in Scotland, you must have a valid driving licence. A foreign licence is valid in the UK for up to 12 months. It is compulsory to wear seat belts in the front seat and if your car has seat belts in the back, they must also be worn. When travelling to Scotland from outside of the UK, make sure you know what emergency healthcare you are entitled to, what medicines you can bring into the country, what to do in an emergency, and what travel insurance you will need. The Scottish Government provides detailed information on healthcare for overseas visitors in PDF, audio and large-print formats.